A fish finder helps detect a fish school and provides various underwater information, such as water depth, distribution of fish school, and the condition of the seabed by transmitting ultrasonic waves into the sea and receiving its reflection. Part of sonic or ultrasonic waves, which have been transmitted, reflect back to the source when they hit an object (e.g. fish school or seabed). A fish finder uses this ultrasonic reflection characteristic. The ultrasonic waves from the fish finder are transmitted directly underneath the boat. If they hit a fish school, very weak reflections will come back to where the ultrasonic waves were originally transmitted. The reflection received is converted into an electrical signal and subsequently sent to the receiving circuit of the fish finder. The receiving circuit amplifies the weak signals, and the processor unit processes them to generate images to be displayed on the screen. As the result, the image will be displayed on the color LCD. Stronger reflections are shown in orange or red, and weaker ones are shown in green or blue on the screen. A fish school of high density or rocks on the seabed return stronger signals, so they will be shown in a reddish color, while a fish school of low density or small fish will be shown in a bluish color. The color presentation can clearly illustrate the undersea condition. 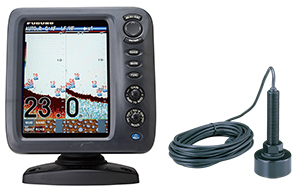 A fish finder consists of two parts: main unit (with a screen) and transducer. The main unit should be located where it can be easily accessed in the cabin or wheelhouse, etc. The transducer should be mounted on the boat's bottom either through hull or in-hull installation. Please bear in mind that the performance of a fish finder depends largely on whether the transducer is properly mounted on the boat's bottom. An improperly mounted transducer may result in failure in capturing reflected waves or other serious defects. To avoid these troubles, you should consult with a technical dealer on how to properly install the transducer prior to actual installation. A fish finder transmits ultrasonic waves from the transducer mounted on the bottom of the boat. The transmitted ultrasonic waves advance straight towards the seabed, but if there is an object, i.e. fish school or rocks, they will reflect. Part of them will reflect back to the ship's bottom, which will then be captured by the transducer. By measuring the time elapsed between transmission and reception of ultrasound, the depth of the fish school will be calculated. 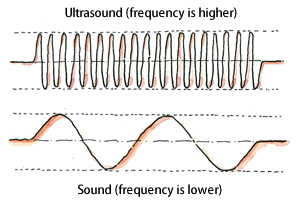 Both sound and ultrasound are, in principle, types of waves. They are just like the ripples on the water surface you see when you drop a pebble into the water. The water ripple normally spreads out 360 degrees, because of its omni-directional characteristics. A fish finder utilizes high frequencies of sharply focused ultrasound, which is transmitted with high voltage in order to determine the direction fish schools are moving. Locating objects in the air is different than locating objects underwater. To locate objects in the air, we can utilize light, radio waves or sound. However, when locating objects underwater, light and radio waves are attenuated rapidly when they travel through water, which is why ultrasound is the most viable option to locate underwater objects. Ultrasound has a high level of tolerance to underwater attenuation. The propagation velocity of ultrasound under the water is approximately 1,500 meters/sec, which is five times as fast as the propagation velocity of ultrasound in the air (340 meters/sec). This propagation velocity of ultrasound is used to calculate the depth at which a fish school is located. 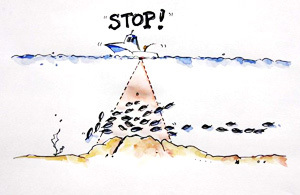 For example, if an echo return from a fish school is observed one second after it transmission, it can be construed that the fish school is located at the depth of 750 meters under the boat (transmitted ultrasound hits the underwater object and comes back in one second, when taking into consideration the propagation velocity of ultrasound, namely 750 meters/sec, you get the depth at which a fish school is located). This is the basic echo-sounding principle of a fish finder. Generally speaking, propagation velocity is proportional to the density of the medium through which light, radio waves or ultrasound travels. Light and radio waves can collect a lot of information in a short period of time, while ultrasound is more time-consuming with its underwater search. For example, ultrasound travels approximately 5,000 meters per second through a high-density medium such as iron. Although propagation velocity of ultrasound underwater is slow, ultrasound is capable of detecting information about fish schools at remarkably far distances. There are various sources of interference that effect the propagation of ultrasound underwater, including: current, water temperature, micro-organisms (i.e. plankton), air bubbles, radio noise, etc. Despite these sources of interference in the environment, a fish finder is capable of grasping the weak echo returns from fish schools. A fish finder transmits ultrasonic waves from the transducer mounted on the bottom of the boat. 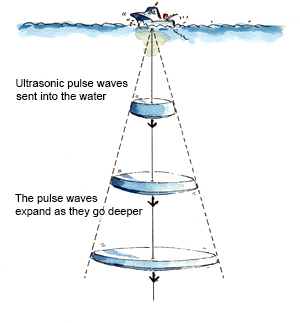 The transmitted ultrasonic waves advance straight towards the seabed, but if there is an object, i.e. fish school or rocks, they will reflect. Part of them will reflect back to the ship's bottom, which will then be captured by the transducer. By measuring the time elapsed between transmission and reception of ultrasound, the depth of the fish school is calculated. Ultrasound is transmitted directly underneath the transducer, which is mounted on the bottom of the boat. The transducer has its own directional characteristics, that is, the characteristics of beams transmitted, which affect the detection capability under the water. The directional characteristics of the transducer are largely determined by the frequency of the ultrasound transmitted and received by the transducer, and this affects the searchable angles and areas. Frequencies commonly used by a conventional fish finder for recreational boat are 50 kHz (low frequency) and 200 kHz (high frequency). A lower frequency has a wider search angle and area. Generally, the searchable angle of 50 kHz beams is approximately 50 degrees and that of 200 kHz beams is approximately 15 degrees. The searchable areas by both kinds of the beams are illustrated below. As you can see, lower frequency beams are suited for wide-area-search at one instance, and higher frequency beams are suited for narrow-area-search. Anglers can make use of these characteristics to find a fish school. Commercial fishermen also make use of these characteristics. They conduct a search by low frequency (i.e., 15 kHz) beams first to grasp the general locations of fish schools around the boat. Subsequently, they narrow the search area for a fish school, using high frequency beams (200 kHz), to detect the exact location of the fish school and operate the boat to be directly above the targeted fish school. Searchable area is determined by the frequency of the ultrasound used. 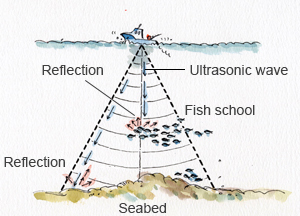 While use of low frequency beams (50 kHz) facilitates a search of wider area, use of high frequency beams (200 kHz) allows the operator to narrow down the search area to detect the more precise location of a fish school. Inside the transducers, transducer elements are incorporated. The transducer element transmits ultrasound through its vibration, which is caused when it receives electric signals. How focused the ultrasound can be transmitted wholly depends upon directional characteristics of the transducer used. The figure on the left hand side shows how ultrasound is transmitted from the transducer. 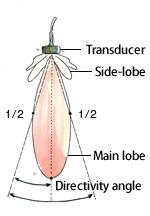 The oval shape just below the transducer indicates signal transmission intensity of ultrasound. The signal strength is the strongest on the centerline of the oval shape, and the signal strength becomes weaker towards the edges of the oval shape. Directivity angle of ultrasound can be generated by connecting the transducer and the points where the signal strength is half of the strongest signal (centerline). Ultrasound frequency used by a fish finder generally ranges from 15 kHz to 200 kHz. However, the majority of the conventional fish finders oriented for recreational craft utilize 50 kHz and 200 kHz. Such fish finders available in the market incorporate electronic circuitry that can transmit and receive ultrasound in these two frequencies. Also, a transducer mounted on the bottom of the craft is configured to handle these two frequencies. However, fish finders for professional use, i.e., those used by commercial fishermen, can make use of other frequencies. Such frequencies include 15, 22, 28, 38, 45, 50, 68, 75, 88, 107, 150 and 200 kHz. There are some special fish finders that utilize the frequency of 400 kHz, but it is quite a rare case. As you can see, there is an extensive range of configurable frequencies available for fish finders for fishery vessels, and a fish finder generally makes use of a combination of two frequencies (high and low frequencies). The selection of the frequencies depends upon the intended purposes of the fish finder, which include, inter alia, finding specific fish species; grasping the seabed condition; conducting a wide-area-search with the search angle of 90 degrees at one go; conducting detailed search for fish schools; detecting fish schools that give weak echo returns; avoiding interference/conflict with other fish finders used nearby. The searchable range (depth) and search area are dependent upon the frequency used. On the one hand, high frequency ultrasound is suitable for a detailed search, although it cannot be used for search in deep water. Low frequency ultrasound, on the other hand, is suited for general searches in a wider area as well as searching in deep water. 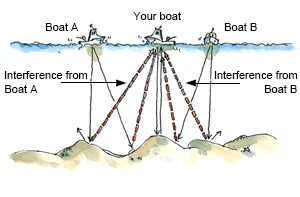 Detection range (depth) of a fish finder depends upon the frequency used for ultrasound transmission. In principle, the higher the frequency of ultrasound, the shorter the propagation range can be. The wavelength of high frequency ultrasound is short, and its directivity angle is narrow, which enables detailed searches, but it attenuates significantly while travelling through water. 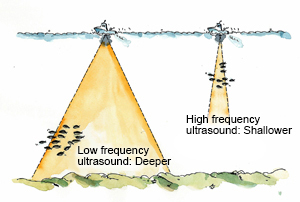 Low frequency ultrasound is characterised by its long wavelength, wider directivity angle and high level of tolerance toward underwater attenuation, hence enabling wide-area-searches in deeper water. To summarize, you can choose low frequency if you are searching in deep water and high frequency if you are conducting a detailed search in shallow water. Further, when using low frequency ultrasound, you may be able to conduct more precise deep-water searches by adding an optional Power Adapter, which amplifies the transmitter power to a few kilowatts. Please note, however, that when using the Power Adapter, a dedicated transducer capable of handling higher transmitter power will be needed. Basically, with low frequency (50 kHz) ultrasound, you can conduct deep-water search, but with high frequency (200 kHz) ultrasound, the searchable depth is not that deep. 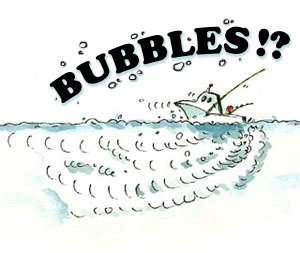 Air bubbles under water are the main nemesis to a fish finder. Ultrasound, when transmitted, travels straight down towards the seabed. However, when the ultrasound hits air bubbles on its way, the surface of the air bubbles reflect it back and it cannot travel any further. Ultrasound is very vulnerable to air bubbles. Even though ultrasound is transmitted with high transmission power, it may be reflected by the surface of the air bubbles or be attenuated when going through them. In such case, ultrasound may not reach fish schools in deep water or the seabed, only showing a strong echo return from the air bubbles. When your own boat goes astern. In the latter case, a mass of air bubbles emanating from the propeller of the boat will completely surround the bottom of the hull, making the passage of ultrasound impossible. Subsequently, a fish finder screen will only show the strong echo returns from the air bubbles. If the interference from the air bubbles is weaker, a fish finder screen can show a very fragmented view of the underwater condition. When you find yourself in such a situation, the only way out is to escape from the area affected by the air bubbles. A couple of ways to avert the adverse effect of air bubbles include: taking into consideration the position where the transducer is mounted; and avoiding to manoeuver the boat in astern direction. If a fish school has been detected, it is advisable to let the boat continue on its course for a while and then turn around to go back to the point where the fish school was first detected. For those who are not used to using a fish finder on board their boat, the general advice is to always control the boat in a forward direction, when searching for a fish school. Air bubbles under water are the main nemesis to a fish finder. Air bubbles underneath the transducer leads to poor or inexistent detection functionality in a fish finder. This is especially true when the boat goes astern, creating air bubbles that block ultrasound, resulting in poor performance. Topic 07 - Are nearby vessels interfering with your fish finder? When two or more echo sounders are operating in close proximity and at the same or similar frequency, it is possible for each to receive false returns from the others transducer. In such cases the operator will see noise and clutter, false returns, dotted lines, multiple bottoms or other video anomalies on the screen. This is most common in and around marinas or harbors where there may be multiple fish finders operating at the same frequencies. In order to get rid of interference, there are a couple of different solutions to try; One way is to shift the frequency emitted from the fish finder�s transducer, if possible, in order to avoid interference. Another way is to turn on the interference removal function on your fish finder. Furuno fish finders have interference rejection circuitry which can be used in such instances, but use it sparingly to avoid eliminating small targets. Interference rejection will automatically try to change your fish finder�s transmission cycles, resulting in less interference. Most of the time fish finder interference is caused by signals transmitted from nearby boats, but in some cases it can also be caused by electronics on your own boat. Make sure that your electronics are properly grounded, and avoid running electrical cables alongside your transducer cable. If previous solutions yield no results, you may try to manually change between low and high frequency on your fish finder to see if the interference disappears. If this still does not help, you may need to distance yourself from other vessels. Whenever other boats are close by, your fish finder might receive interference. Diagonal lines and noise such as spots might appear, making the video presentation difficult to read. The physical device inside a transducer that creates the sound wave is a piezoceramic disc called the element. The element, when voltage is applied, vibrates - it distorts and reforms its shape in very rapid succession. This vibration occurs at a specific frequency and creates compression waves, or acoustic energy - sound waves. These waves travel outward from the element in a vaguely cone-shaped pattern and encounter targets along the way. 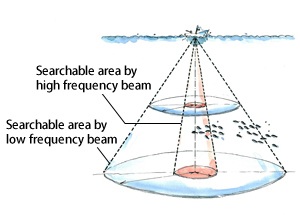 As this acoustic energy encounters targets such as fish or bottom structure, some of the beam will be attenuated (absorbed by the target), some will be reflected back at the transducer as an echo and some will be scattered. As the reflected echoes strike the transducer they cause a minuscule distortion in the shape of the crystal. This distortion of the crystal creates a small fluctuation of voltage, which can be detected and processed by the fish finder. The end result is an image on your display. By measuring the time from when the sound wave is generated to when the return echo is received, we can learn the depth at which a target is encountered. The strength of the reflected echo can tell us about the size and density of the target. Some transducers are referred to as single-element transducers. This means that they contain a single piezoceramic disc that vibrates alternately at 50kHz and 200kHz, utilizing both operating frequencies. When greater performance is desired or required, multiple element transducers are available that can significantly enhance the performance and sensitivity of your fish finder. A multiple-element transducer is one in which separate elements vibrate individually at their respective frequencies. Some high-end models utilize seven, nine or even fifteen 50kHz elements along with a large-diameter 200kHz element. The dedicated 200kHz element offers enhanced sensitivity in shallow water, while the greater surface area of the 50kHz array will receive echoes from deeper water with much more clarity and detail. There are some important points that are true for every transducer installation. Acoustic noise is always present, and these sound waves can interfere with your transducers operation. Ambient (background) noise from sources such as waves, fish and other vessels cannot be controlled. However, carefully selecting your transducers mounting location can minimize the effect of vessel-generated noise from the propeller(s) and shaft(s), other machinery, and other fish finders. The lower the noise level, the higher the gain setting you'll be able to use effectively on your fish finder. As a rule, no transducer should be located near a water intake or discharge opening, directly aft of any lifting strakes, steps or other obstructions or irregularities in the hull , or behind eroding paint (an indication of turbulence). The flow of water across the transducer face must be as smooth as possible in order to get the best performance while cruising. Most standard transducers are designed for recreational fish finders and generally have a single element that resonates alternately at 50 and 200 kHz. Although these transducers are effective and inexpensive, greater performance can be had by matching your recreational fish finder with a high-performance transducer. These transducers are rated for a greater power output and contain an array of 50kHz elements along with one or more large-diameter 200kHz elements. An array of 50kHz elements allows for a very tight beam pattern, meaning there will be more energy on-target to produce return echoes. Also, the greater surface area of this array makes the transducer more sensitive to return echoes, enabling greater target resolution on the screen. The same is true of having one large, dedicated 200kHz element - its tighter beamwidth and greater sensitivity create a better performing transducer at all power outputs. An electrical signal from the fish finder is applied to the transducer, which sends out an acoustic signal - sound waves - into the water column. The transducer receives the reflected echoes from objects that these sound waves encounter and they are sent as an electrical signal to your fish finder. It is the fish finder's job to process this signal into a picture of the underwater world on your screen. The transducer in the fish finder transmits ultrasonic pulse waves made up of high pressure and low pressure pulses. The wavelength of each pulse is defined as the distance between two successive high pressure pulses or two successive low-pressure pulses. For example, when an electrical pulse is applied to a 200kHz transducer the element vibrates at a frequency of 200,000 cycles per second � that is, 200,000 individual sound waves are transmitted from the element each second. Short-wavelength, high frequency transducers produce sharp, crisp images on the fish finder display. Lower frequency wavelengths �see� deeper in the water column than higher frequency wavelengths, and so a boost in power is not always necessary to detect fish in deeper water. The lower in frequency that you go, the deeper the echo sounder will see for the same amount of power. You can also increase the fish finder�s detection range in all frequencies by using a narrower beam transducer. A narrow beam delivers more energy on-target, resulting in stronger echoes, improved target resolution, and the ability to �see� deeper into the water column. The transducer mounted on the underside of the boat transmits ultrasonic waves or 'pulses' that travel down to the seabed. As the sound waves travel through the water, they scatter and gradually lose strength. When these sound waves hit either fish or plankton, they will bounce back up to the transducer. The shape generated by a single fish and a fish school varies greatly, but when ultrasonic waves hit a fish school they will bounce back in all different directions. Parts of these reflected ultrasonic waves from the fish school will return back to the transducer under the boat. If the distance to the seabed is 100 meters or less, the echo from the seabed will be much stronger than any fish schools in between. The reflected ultrasonic waves from the fish school will scatter on their way back to the transducer making the signal very weak. This faint signal gets picked up by the element inside the transducer, which in turn sends the information to the main unit of the fish finder. The transducer of a fish finder is a comparatively small thing, measuring only about 7-10 centimeters in diameter for normal recreational vessels. Even though this diameter is small, this is the area that receives the ultrasonic waves returning all the way from the seabed. The reflected ultrasonic waves from the fish school will scatter on their way back to the transducer making the signal very weak. This faint signal gets picked up by the element inside the transducer, which in turn sends the information to the main unit of the fish finder. The transducer of a fish finder is a comparatively small thing, measuring only about 7-10 centimeters in diameter for normal recreational vessels. Even though this diameter is small, this is the area that receives the ultrasonic waves returning all the way from the seabed. What makes this job hard for the fish finder is that there is a lot of noise in the water, and the echo from a fish is very weak. Out of all the noise that gets generated by pollution, air bubbles, plankton and more, the fish finder has to discern the reflected ultrasonic waves from a fish school. This is especially true when it comes to fish schools that stay close to the seabed. There is a lot of noise and it can be hard to discern what are fish schools and what are not. At times like these, the built in noise removal functions in a fish finder can come in very handy. Ultrasonic waves usually hit the top of a fish, and depending on the angle that the waves hit the fish the returning echo will change direction. The returning echo will then scatter as it travels back to the surface, resulting in a very weak signal that the transducer in the fish finder has to pick up. 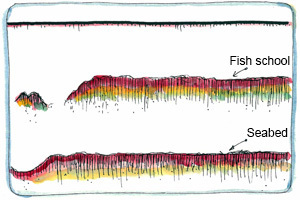 Through the fish finder it is possible to identify the different sediments of the seabed. 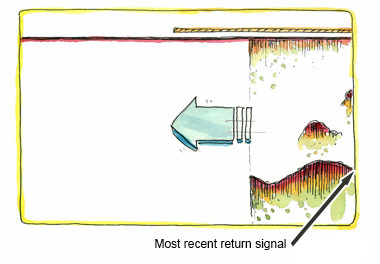 The seabed generates a strong echo when hit by ultrasonic waves, which is displayed on the fish finder screen as a red or brown line. When you are out fishing you will notice that the amount of seabed displayed on your fish finder changes depending on its hardness and composition. The part of the seabed that gets displayed on the fish finder screen can sometimes be called the �bottom trail� or �bottom band�. If the returning echo from the seabed is strong, the amount displayed on the fish finder increases. What this mean is that the bottom is hard and most likely consists of bedrock or reefs. The opposite is true for a soft seabed. When the seabed is soft the �bottom band� will be very thin, due to the fact that the returning echo is weak. When the returning echo is weak, the seabed likely consists of sandy soil or sand. The amount of seabed displayed on the fish finder screen also depends on the frequency used by the fish finder. Generally speaking, the �bottom band� displayed will increase when using low frequency ultrasonic waves, and decrease when using high frequency ultrasonic waves. If you wish to get a good view of the seabed on your fish finder, it is recommended to set the fish finder to 50kHz, making it easier to judge the properties of the seabed. When fishing for rockfish for example, it is very useful to be able to judge the properties of the seabed since these fish prefer rock outcrops. Rocky areas on the seabed will give of a strong echo, displayed prominently on the fish finder display. The returning ultrasonic waves from the fish finder will be displayed as a thick bottom. On the contrary, when the seabed is soft it will be displayed as very thin line. This is due to the seabed absorbing a big part of the ultrasonic waves emitted from the fish finder. Lets have a look at what kind of information gets displayed on a fish finder screen. 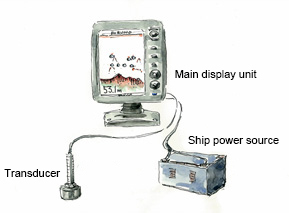 The image below shows a typical fish finder screen. A fish finder screen usually displays the sea level, sea bottom and fish schools in between. Based on the data received by the fish finder and the fish finder's settings, display of the sea level, sea bottom and fish schools will vary in shape, concentration, hue and distribution. First of all, at the very top of the graph we see the minute marker, a thin yellow line. This yellow line combined with the empty line following it represents exactly one minute. Right below the minute marker we find the transmission line. The transmission line corresponds roughly with the sea level, so it can henceforth be considered as the sea level. Strictly speaking, it denotes the position of transducer transmitting ultrasonic pulse waves mounted on the underside of the boat. The transmission line varies in size depending on which type of transducer is used and what frequency the transducer is transmitting at. When the line is thick, there is a risk that it might overlap fish schools close to the sea level, making them hard to distinguish. Below the transmission line is the water column, where fish schools swimming around can be seen. 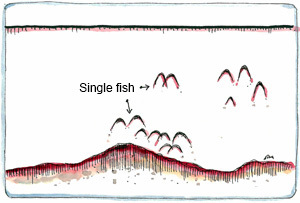 When fish schools are detected by the fish finder, they can be displayed in a variety of ways; like lumpy clouds, mountain or round shaped formations, or as sporadic dots. One handy feature of the fish finder is the ability to distinguish between normal protrusions on the seabed and fish schools grouped close to the seabed. It is also possible to determine the location of fishing lines hanging from your own boat, as show on the left side of the illustration. Close to the sea level on the right side of the illustration, we can see plankton and what air bubbles (aeration) from the propeller looks like on the fish finder screen. Fish finders can also display the distance to seabed, range scale, ultrasonic pulse wave frequency, A-scope mode and much more. Depending on the type of fish finder, there are also functions that allow for GPS positioning, providing longitude and latitude data of the own boat on screen. 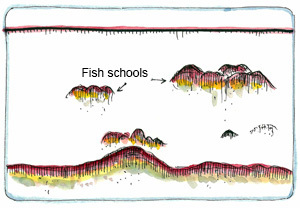 This illustration shows what a typical fish finder display looks like, with information about the different fish schools swimming about, plankton, individual fish, and fish schools close to the seabed. It also shows air bubbles generated by the boat propeller and fishing lines beneath the boat. Small to medium sized fish finders for pleasure boats usually come with a main display unit and a transducer. Inside the main display unit we find the circuitry for transmitting and receiving ultrasonic waves, as well as, circuitry for processing the data to display information on screen amongst other things. The transducer contains a small oscillator, a piezoceramic element, that sends out ultrasonic pulse waves into the water column. In order for communication between the transducer and the main unit to take place, a cable is needed to connect them both. Electricity is also needed; the power cord is attached to the main unit and then connected to the battery. The main unit should be set up next to the ship controls on the helm to make operation easy, while the transducer needs to be mounted properly. There are several different mounting possibilities, which will be covered in the section 15. Transducers that are mounted on small sized pleasure boats are usually not bigger than 3-7cm. The transducer is shaped like a nut with a bolt that can be attached at the end. The length is roughly 12cm and when inserted through the hull, it can be mounted properly by using the accompanying bolt to fasten it. Fish finders for smaller pleasure boats and fishing boats usually come with these two units included. Fish finders for larger pleasure boats and fishing vessels can vary a little bit more in terms of what comes included, there might be more parts and their design will differ slightly. Fish finders and other electronics need electricity to function. On boats electricity is supplied from the batteries installed in the battery compartment. 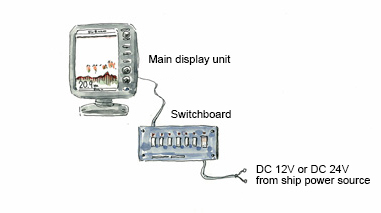 Excluding special super compact fish finders, most fish finders use DC 12-24 volt power supply. As long as the voltage is between 12 and 24 volt, the fish finder unit will function properly. For exact details please look up the respective product information sheet regarding your fish finder. Smaller boats will usually come installed with one DC 12 volt battery, for boats with two DC batteries in a serial connection 24 volt can be used. The battery is connected to the main switchboard, and the power cable from the fish finder is connected to the same switchboard. A common practice is to install manual switches on the power cable in order to turn on or off the power to the fish finder unit quickly. It is important to remember to first turn off the fish finder unit before cutting the power, in order to avoid malfunctions. For vessels utilizing 24 volt batteries, the fish finder should always be attached to the switchboard first. The capacity of a battery is predetermined (capacity being how much charge it can deliver at a specific voltage). Larger batteries offer longer operational time versus smaller batteries that can only keep the fish finder active for a limited amount of time. In order to know the capacity of the battery simply look at the packaging for �AH�, meaning �Ampere Hour�. The different ways listed here all have their unique advantages and disadvantages, with the ideal mount being the first, Through Hull. This mount consists of carefully cutting a hole in the bottom of the boat and fitting the transducer inside, so that it is in direct contact with the water. Since the transducer is mounted through the hull, the ultrasonic pulse waves and returning echoes are very clear. However, the caveat is that you need to cut a hole through the hull, which is something that deters a lot of boat owners. This brings us to the next way of mounting transducers, In-Hull or Shoot-Through mount. In-Hull mounting means that the transducer is mounted against the hull of the ship, fastened with silicon in a special case. This case is later filled with a type of oil to make sure that the transducer is in full contact with the hull. It is very important to choose a proper mounting location, otherwise air turbulence from below the vessel might cause interference. The downsides with In-Hull mounting is that first of all, it does not work with vessels that have hulls made of aluminum, wood, steel or any material that absorbs a lot of the ultrasonic pulse waves. 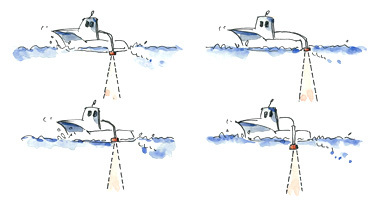 Secondly, since the signals are transmitted through the hull, a certain amount (20-50%) of the signal will get lost, resulting in lower performance and ability to detect fish. Thirdly, for those with fish finders sporting the �ACCU-FISH�� functionality, it is recommended to mount the transducer using Through-Hull or Transom mount. If the bottom detection function of recent FURUNO Fish Finders want to be used, the transducer has to be mounted either through Transom mount or Through-Hull. Transom mount is common in smaller boats, the transducer is mounted below the waterline at the transom. This way of mounting the transducer is popular due to its simplicity, but it also runs the risk of interference from aerated water originating from the propeller. The fourth and final way to mount the transducer is side mount, which is an improvised way where the transducer is mounted on a long pole. During travel to and from fishing grounds, the pole is taken up from the water. The benefit here is that for boat owners who do not wish to make proper Through Hull installations, it offers good performance while being very simple. Returning echoes from the water below will show fish schools, the seabed and plankton in color on the fish finder screen. However, what is actually shown on the fish finder screen is not real images of these fish schools and plankton. The image on the fish finder screen is the result of the returning echoes coming from the seabed that pass through the transducer, through the reception processing and image processing circuitry of the fish finder and then finally to the screen. Depending on the echo strength, the color on the screen changes accordingly, the stronger the echo the deeper the color. In previous chapters, information on the fish finder screen has been discussed, but not how the fish finder screen looks when in motion. The echoes coming from the fish schools below are displayed according to the time received by the fish finder in a sequential manner. The incoming signals are displayed sequentially scrolling from the right side of the screen to the left. The right side displays what the fish finder sees in that instant, and this data scrolls to the left. The data on screen is purposefully moving at a constant speed, scrolling from the right to the left. The scrolling speed can be easily changed, making it easy for the user to find a comfortable setting. When the scrolling speed is set to high, even a small fish school will show up as a large echo on the fish finder screen. When connecting your fish finder to power, it is important to use separate batteries for the engine generator and the fish finder if possible. The reason for this is that there can be a lot of engine noise interfering with the signal to the fish finder. In order to avoid unnecessary noise and interference, it is advisable to install the power cable and transducer cable to the fish finder separately. Usually when spotting fish on a fish finder display, the fish is formed into large fish schools. These fish schools show a great deal of variation when displayed. Their shape can be said to resemble fluffy clouds, towering thunderclouds and thin blurry formations. This cloud like pattern depends on the species of fish, the behavior and the way the fish schools swim through the water. The way individual fish and fish schools are displayed on screen differs greatly, making it easy even for novice fishermen to spot the difference. For example, sardines tend to group together in very large and compact fish schools. These fish schools will then get displayed accordingly, large with intensive colors denoting concentration. Horse mackerel swim at a different depth compared to sardines, but their way of forming schools is very similar. Fish species that form schools vary considerably when it comes to shapes and sizes, but the common element is that the fish finder display shows fish schools in a bulging or protruding fashion. Individual fish swimming about are very easy to identify since they have a very distinct boomerang or half moon shape. When observing individual fish, one can notice that they move around seemingly aimlessly flocking where they believe food might be found. How do fish schools get displayed on the fish finder screen when the boat is not in motion? Lets think of an example where your boat is at a standstill over an area with large rocks. The fish finder is in operation, and the image is sequentially streaming from right to left. In the picture below to the right, we can see that at first there is no indication of fish schools and then a fish school appears, swimming over the rocky area. For the sake of argument, lets assume that the fish school remains in the same position while the boat is still. We will see the returning echo from the fish school appear continuously from the right to the left, it will keep on displaying the fish school in the same manner as long as it stays in the same position. Even though this fish school in reality looks like a large lump, on the fish finder screen it looks like a large fish school. The rough seabed will also appear as a smooth line since the boat is not moving. If one stays in this position long enough, the fish school fills the entire fish finder screen and it is easy to misinterpret as one enormous fish school.